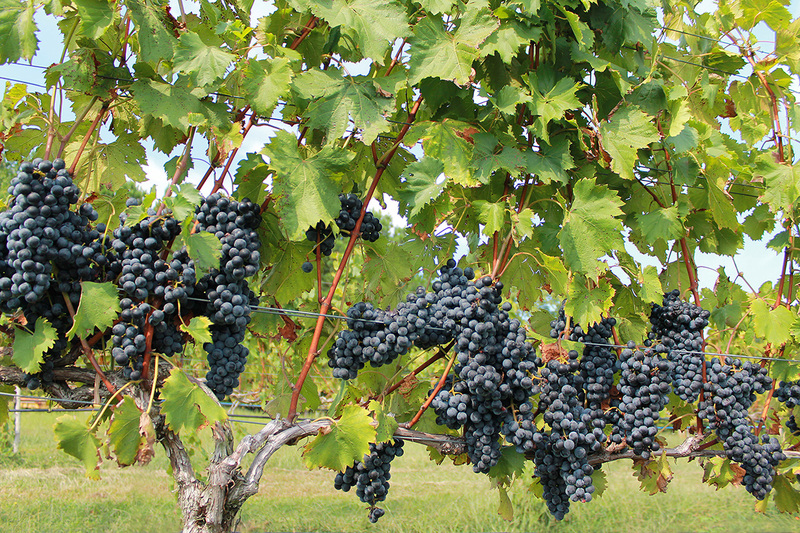 Chambourcin grapes at Silk Hope Winery, one of the stops on the Farm & Industry Tour. Photo by Debbie Roos. The Chatham County Center of North Carolina Cooperative Extension is hosting its annual Chatham County Farm & Industry Tour on Tuesday October 3, 2017 from 8:00 a.m. – 4:00 p.m. (times may vary based on pick-up location). For over 20 years the Chatham County Center has led this popular tour to increase public awareness of Chatham County agriculture, forestry, and industry. The Farm & Industry Tour is sponsored by the Chatham County Farm Bureau. Four educational stops, including equine husbandry, wine production, sustainable wood products, and industrial composting, are planned for this event. The Arauco-NA site in Moncure manufactures and laminates composite wood panels for use in furniture, store fixtures, cabinets, flooring, moulding, door manufacturing, distribution, and other uses. The Moncure site is one of many Arauco-NA facilities in North America, and is part of Arauco, an international manufacturer of wood products based in Chile. Arauco-NA is one of the largest non-governmental employers in Chatham County. Bar T offers training tailored to the specific needs of the horse and rider, everything from a one-day lesson to riding clinics to a 90 day advanced training program. Owner Jim Thomas became well-known after he competed in the inaugural Extreme Mustang Makeover in 2007, where trainers had 100 days to tame and train wild mustangs. Jim has continued to compete and raise money for the Wounded Warriors program. McGill Environmental Systems is conveniently located in the eastern part of Chatham County and is one of the largest privately held composting facilities on the east coast. Founded in 1991, this organics recycling and compost manufacturing company has multiple composting operations in the U.S. and Ireland, employing about 100 people in total. All feedstocks are processed in a tightly-controlled indoor environment using a modified version of the Rutger’s aerated static pile process. Silk Hope Winery is a small family-owned winery in the heart of North Carolina’s Haw River Valley wine region. The 2 ½ acre vineyard is located at the top of a hill and yields a variety of wine grapes including Chambourcin, Cabernet Franc, Norton, Vidal Blanc, and Traminette. The prime location of the vineyard allows for a late-season harvest that yields high quality fruit that is turned into award-winning wines. Get Your Farm Tour Tickets! Tickets cost $15 per person and include transportation, snacks, and a catered lunch. Tickets must be purchased in advance to reserve your spot and are available at the Chatham County Cooperative Extension office in the Chatham County Agriculture & Conference Center located at 1192 US Hwy 64W Business in Pittsboro. Checks should be made payable to Chatham County Cooperative Extension. The tour is limited to 60 individuals on a first-pay, first-served basis. Carolina Meadows: pick up – 8:25 a.m., return – 3:55 p.m.
Siler Crossing Shopping Center in Siler City (parking lot adjacent to CashPoints ATM): pick up – 8:35 a.m., return – 4:00 p.m.
Chatham County Agriculture & Conference Center: pick up – 8:45 a.m., return – 3:45 p.m. Gathering Place at Fearrington Village: pick up – 8:25 a.m., return – 4:00 p.m.
We do request that participants wear comfortable, weather-appropriate attire (full-length pants are advised). Closed-toe shoes are REQUIRED for the tour. For more information, call the NC Cooperative Extension, Chatham County Center office at 919-542-8202 or email extension.programs@chathamnc.org.